SylysJ wrote: Tonight's dinner. 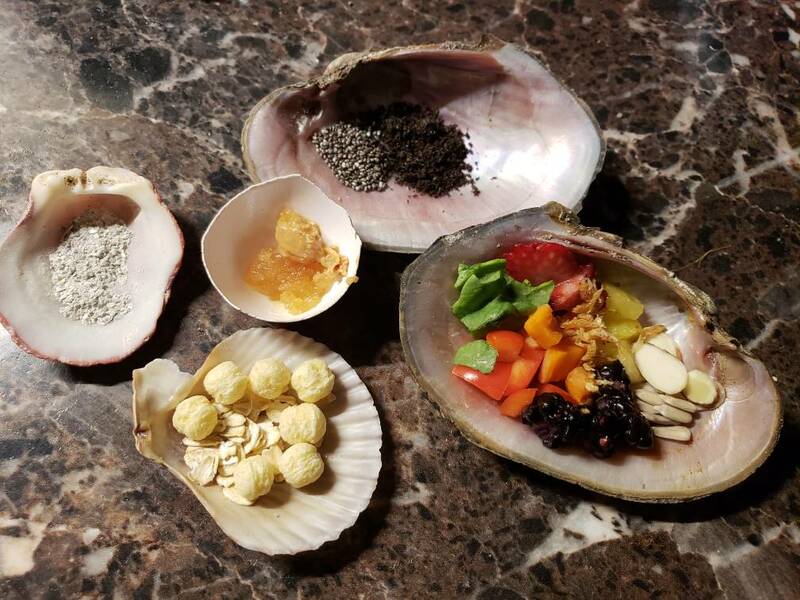 Pineapple, strawberry, spinach, blackberries, carrots, bell peppers, shrimp, almonds, sunflower seeds, some honey and pb, kix and organic oats, crushed oyster shells, chia seeds, and worm castings. That KIX! I want to go get myself a bowl and eat it! Looking at these menus ... are your crabs big eaters? Or do you just put tiny amounts in the tank? I have two crabs and they hardly eat anything. Their favorite things are boiled egg, sliced almonds and cuttlebone. They LOVE the cuttlebone. I've tried them on strawberries and grapes -- they won't eat them. They've currently got cantaloupe in there, and they've not touched it, but I'm hopeful. I've also tried leaves from the approved list, to no success, and the same with lettuce. I bought some of the crab food on Etsy (that has dried greens and ground corn, and is all nice and fishy smelling), and they hardly touch that. I put honey in there once and it disappeared, so I guess they ate it. Just not sure what else to try for my finicky guys. They're worse than my cats! We are trying fresh Salmon tonight along with their other favorite foods. krbrown2000 wrote: Looking at these menus ... are your crabs big eaters? Or do you just put tiny amounts in the tank? I have two crabs and they hardly eat anything. Their favorite things are boiled egg, sliced almonds and cuttlebone. They LOVE the cuttlebone. I've tried them on strawberries and grapes -- they won't eat them. They've currently got cantaloupe in there, and they've not touched it, but I'm hopeful. I've also tried leaves from the approved list, to no success, and the same with lettuce. I bought some of the crab food on Etsy (that has dried greens and ground corn, and is all nice and fishy smelling), and they hardly touch that. I put honey in there once and it disappeared, so I guess they ate it. Hi there! My guys don't care for strawberries or grapes either...and I have four tanks! 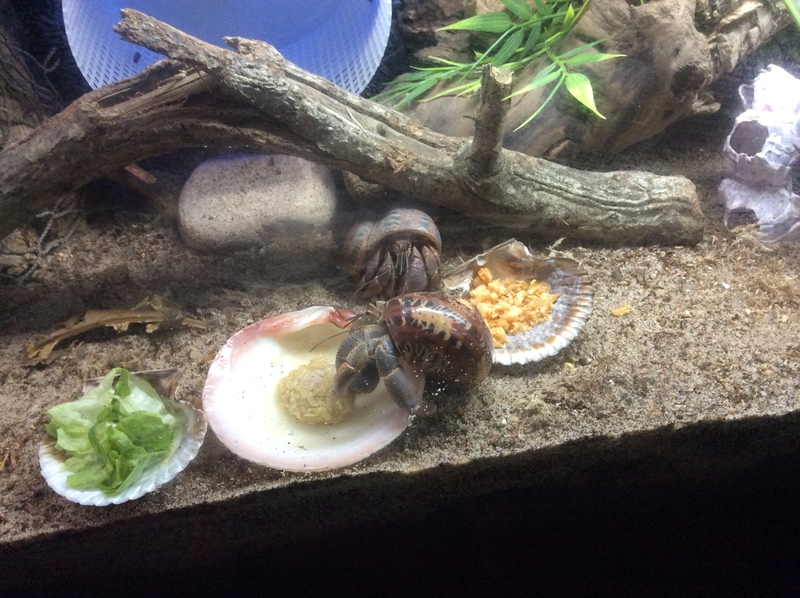 Actually, my crabs do like the green tops of strawberries. 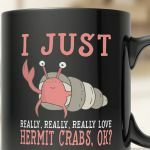 Anyways...crabs take tiny bites. Sometimes crabs drag stuff off and bury it also. Don't get discouraged because you think they aren't eating. More than likely they are, and you just don't notice. 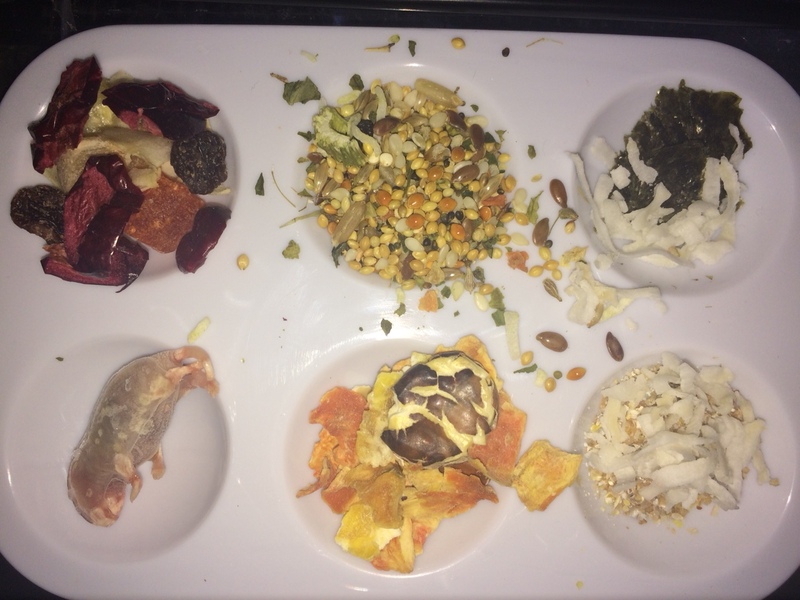 Starting top left we have- tropical and berry dried fruit, fruit and veggie seed mix, green seaweed with coconut. Bottom left- frozen pinkie mouse, veggie garden mix, 10 grain cereal topped with coconut. Make sure you have protein! Indeed. I'm out and need to pick some up. Any suggestions? Freeze-dried shrimp, bloodworms, or dried mealworms or different bugs. Any beef, pork, or chicken? I just wanted to take some time and list tonight’s menu, and some new food I started feeding. I think I got it all! tonights buffet, my first attempt at sushi ever, and it didnt turn out bad. havent seen any real eating, but my most active guy has already investigated quickly. Nori, strawberry leaves from my garden (100% organic!) black beans, mango, carrots and raw shrimp. 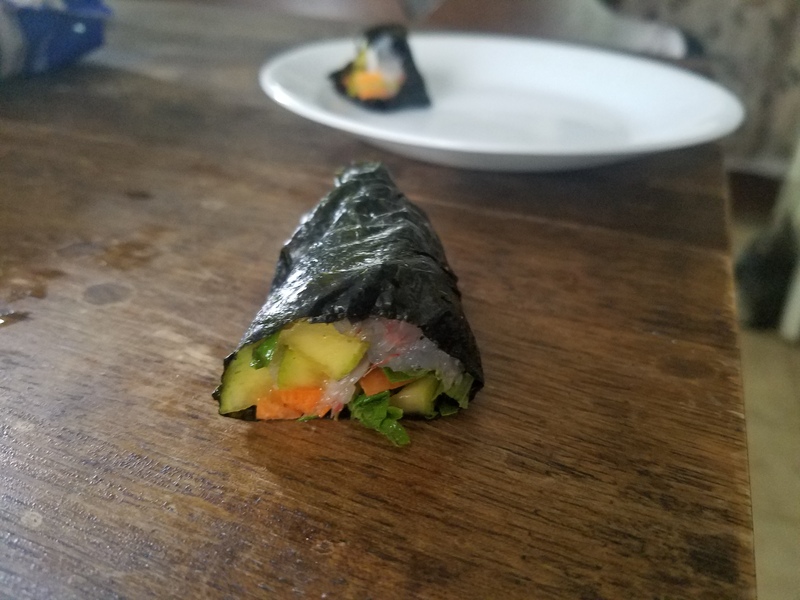 my next try at sushi will be swapping out the mango for kiwi, and shrimp for salmon. I tried fried chicken tonight, they like it! It’s just raw chicken, olive oil, oatmeal, and then lightly cooked on a skillet. Here is tonights meal if you want to know! It only took a minite before there were takers.